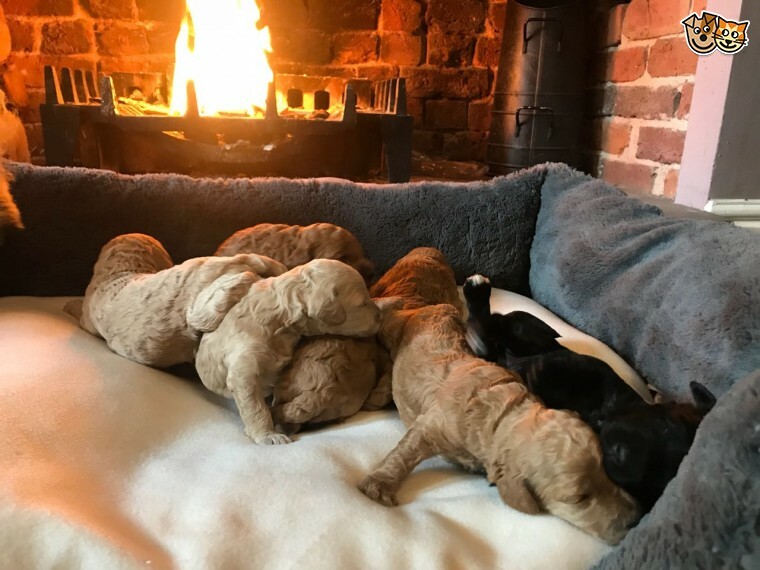 We have a gorgeous litter of 7 F1b Cockapoo...s from our own gorgeous Cockapoo. Mum has a wonderful temperament and is very attentive and loving to her growing puppies. We have 5 beautiful boys . 4 Fox Red 1 Dark Champagne and 2 girls . 1 Jet Black and 1 Dark Champagne . As they grow they are being socialised in our busy home to get them used to everyday sounds. smells and experiences to give them a happy and confident start. Dad is a gorgeous Fox Red Kc Registered miniature poodle who is hereditarily cleared for prcd.PRA copies of 5 generation papers provided. They are being regularly wormed with Drontal and will be vet checked. first vaccination given. microchipped. have 4 weeks free insurance. a familiar scented blanket and a supply of quality puppy food. If you would like to meet mum and her puppies or have any questions please do not hesitate to contact me . Thank you . ..we have only 1 beautiful champagne girl to reserve thank you..